So the President has spoken. But to whom? That is the first question to be asked. Without ever trying or daring to name those who forced him into this – the famous gilets jaunes – he spoke words of contrition in homoeopathic doses, and, as the press immediately pointed out, ‘granted’ measures to reduce the financial burden on the poorest part of the population but ‘without conceding’ anything that would have marked a change of course, or satisfied the movement of revolt that has so deeply shaken the country over the last four weeks. It will become clear in the coming days who has gained exactly what, both immediately and in the longer term, and who can be satisfied with it. Once again, Macron promised that citizens would have their say in a ‘consultation’ of national scope, in which he would contact local elected officials himself. And he seasoned his speech with two elements that should cause great concern to all democrats. First, a long proclamation of severity against ‘disorder and anarchy’ – ‘I have given the government the most rigorous instructions’ – meaning that demonstrations are placed under a kind of preventive state of emergency and that police brutality will not be subject to any restrictions. Then a strong return of the theme of national identity, of nauseating memory, immediately translated into the ‘question of immigration’, a ‘question’ that has played no role in the recent movement, but whose resonances on the right and far right of the political spectrum are well known. Then a strong return of the theme of national identity… immediately translated into the ‘question of immigration’, a ‘question’ that has played no role in the recent movement. I do not believe that this speech, and the orchestration it will receive, despite some international warning and chuckling, will help the president out of the absolute impasse he has locked himself into after eighteen months of exercising power. This opens up both interesting possibilities and formidable unknowns. But to try to decipher these, we must first review, schematically, the conditions under which he came to power and the most salient features of the policy he has followed, which perhaps not everyone had imagined in this form. On the first point, I will simply recall that Emmanuel Macron was elected, not as has sometimes been said ‘by default’, but in opposition to a candidate that the majority of the country, regardless of opinion, did not want, and that her television performance had eventually discredited (though this may change sooner or later). His candidacy had been prepared a good way back by a network of inﬂuence which stretched from the top echelons of ﬁnance and the civil service to some intellectual and trade-union representatives of social liberalism, but in which the former immediately had a decisive influence. This is why the famous ‘at the same time’ of his electoral discourse, vaguely Hegelian, was immediately tipped in favour of neoliberal economic and social policies, in a very aggressive form justified by the watchword (not very original) of a long-delayed ‘modernization’, combined with a ‘refoundation of Europe’. While his predecessor very quickly caved in to the injunctions (and probably blackmail) of the French and foreign business community, as well as to lessons of budgetary rigour from Germany and Brussels, Emmanuel Macron anticipated these, with the avowed claim of joining in their management. But perhaps the most serious consequence for today’s situation was the way in which, lacking a real political party or movement of his own, he had a fictitious parliamentary majority elected in the wake of his victory, on the usual grounds of governmental effectiveness, recruited by managerial methods on the basis of their CVs, with no autonomy or implantation on the ground, thus completing the discrediting of representative democracy, already very badly affected by the authoritarian institutions of the Fifth Republic. On the second point, I think we should mention at least four overlapping aspects, each of which obviously deserves a more in-depth analysis. The first is the decisive European dimension, given the current economic situation and the interdependence of national economic and political systems. It is certain that the situation is very difficult, since the EU has entered an existential crisis, probably irreversible, marked by a deep disaffection of public opinion and the successive collapse of states into ungovernable situations, by a gigantic widening of the gaps between the various regions of the continent, and by the ossiﬁcation of conﬂict between ‘sovereigntyist’ and ‘Europeanist’ discourses, which tends to merge together with social antagonism, but adds to this nationalist connotations going as far as xenophobia. It is certain that the situation is very difficult, since the EU has entered an existential crisis. However, the need for the unity of nations on a continental scale is so great, both to cope with global financial hazards and to initiate the transition to an economy of solidarity in the fields of energy, consumption and climate, as well as to reduce inequalities and facilitate the movement of people (especially young people) across borders, that we could have been pleased to see Macron at the head of the second camp. Except that he did so in a totally unrealistic and conservative way, raising neither the question of the European budget, nor that of the accounting ‘rules’ of economic orthodoxy, nor that of transnational common goods, nor that of the in-depth democratization of European Community institutions. In the end, therefore, he reinforced the status quo that is leading to fragmentation, when it was necessary to aim at a genuinely new creation of a Europe in the service of its populations, running against the direction of France’s partners if necessary. In some areas, such as the crisis in the reception of refugees and migrants, he has continued and even aggravated the unscrupulous double standards of his predecessors, which is not without its consequence on the public mentality. European policy is clearly inseparable from the bloc of economic and financial policies forming the heart of what must be called Macronism. This is a politics of reinforced austerity that does not speak its name (it actually does, but in an esoteric jargon based on a certain dominant economic ideology, which has remained unchanged since the great crisis of the 2010s, and despite its lessons: ‘supply-side policy’ and ‘competitiveness’, ‘control of public expenditure’, ‘encouragement to the investment of wealth’, ‘reduction of labour costs’, ‘ﬂexicurity’, ‘digital champions’, etc.). The only ‘effective demand’ that really matters for this politics is export demand, or the demand of the privileged classes who can afford high prices for basic consumer goods. The only ‘effective demand’ that really matters for this politics is export demand, or the demand of the privileged classes who can afford high prices for basic consumer goods and even add extras, ‘German-style’, to the detriment of the living standard and purchasing power of the vast majority of the population. This orientation is ultimately suicidal for the national economy itself. We are still further removed from the vigorous neo-Keynesianism that is necessary to lead collective activities and individual skills in the direction of transforming the growth regime, the mass training of individuals and the improvement of local amenities that the crisis of the old industrialist model requires. Stock market indices and shareholder value reign supreme, and the income gap is continually widening, steadily creating a kind of dual society. Public services are trimmed to adjust the national budget, and the government sees the civil service as a declared enemy. The tax system, with any progressive character abandoned, is ever more clearly becoming a system of subsidy for the possessing classes by the dispossessed (not to mention the refloating of banks by taxpayers in time of crisis, and complacency towards tax evasion). This touches on the third aspect, which is undoubtedly the most sensitive, being closest to daily life. It is this that the gilets jaunes revolt, precipitated by a new tax that boldly declared itself ‘ecological’ (despite not affecting any of the heavy carbon-guzzling activities or supporting any alternative policy), has exploded in the face of our governments and their advisors. Social policy – in this case essentially repressive and destructive, and therefore anti-social – is only the other side of economic policy. Perhaps a capitalist regime is never egalitarian. But at least it can remain for a while within the limits of liveable inequality if social ‘conﬂictuality’ – formerly known as ‘struggles’ – along with policies of national interest and cohesion (which now need to be rethought at a continental level and beyond) curbs impoverishment and imposes a certain degree of redistribution, whether through taxation or public services. On the contrary, everything happened as if Emmanuel Macron had seen his election as a mandate to accelerate the ‘scrapping’: a scrapping of labour legislation, of progressive taxation, of arbitration and occupational representation, of public service and social assistance. Perhaps the underlying idea was that the devastation of ‘civil’ society, with its potentially demoralizing consequences and the effects of ‘disafﬁliation’ or ‘social insecurity’ (Robert Castel), would be offset by a mixture of ‘entrepreneurial’ propaganda and well-meaning moralism, without suspecting that there could be a backlash. I will dwell on this point for a moment and make it my fourth aspect. We should not just speak, in the old-fashioned way, of the ideological dimension of Macronism, but rather of a symbolic charge that eventually exploded with extreme violence, because it encountered and merged with a material situation that had become intolerable for a very large number of people. It is right to emphasize the character traits revealed by the president’s behaviour: his aggressiveness, his proclaimed contempt for ‘losers’, the ‘illiterate’ and the poor who can no longer make ends meet, to the point that his entourage eventually had to explain to him the negative effects on his ability to govern. We should not just speak… of the ideological dimension of Macronism, but rather of a symbolic charge that eventually exploded with extreme violence. But I believe this is only the surface of a larger problem, as reflected in the ubiquitous formula at gilets jaunes gatherings: ‘they take us for fools’. ‘They’, i.e. the entire dominant technocracy in this country (which is also often a plutocracy), ranging from a President who fantasizes about being a ‘master of the clocks’ and algebras to those who try to reform school curriculums with a magic wand (or even an axe), and the ‘Toulouse’ economists who explain without laughing in their op-ed columns that France’s difficulty of ‘staying in the race’ come from the absence of a ‘basic economic culture’ on the part of its citizens. It would be wrong to believe that this has not been noticed, and especially that the mass of citizens have forgotten the difference between the democratic postulate, which is the competence of the people once provided with necessary, sincere and intelligible information, and the oligarchic postulate of their ignorance and stupidity. Bring this resentment together with a distress that puts people’s backs to the wall, add a flagrant pretence about ecology (the very day after the resignation of the minister who had been noisily charged with defending ecological values, and who did not hide his sense of betrayal), and you get a real popular revolt, perhaps uncertain of its perspectives but perfectly aware of its purpose, and for this very reason immune to coercion, as long as its causes have not been clearly taken into account. We now come to the confrontation that the President, once again playing on his ‘stature’ and ‘function’, evaded rather than acknowledged in his speech. Despite his denial, this exists none the less, and on a double level: between, on the one hand, his person, his speech (scant, prepared, circumvented), his presidential posture, and on the other hand, ranged against him, the democratic gesture of the gilets jaunes, strategically occupying the roundabouts and motorway tollbooths of France, from time to time also its squares and main avenues, demanding a change rather than a catalogue of additions and subtractions. Between the two, there is also the perception of public opinion: is the government playing fair or only pretending to do so, is it seeking negotiations or to benefit from and even favour a deterioration. This public opinion is measured by the polls and by the words exchanged on the square; these reflect its meaning and development, and it is what everything will ultimately depend on. Impression of the yellow vests protests versus President Macron on the Champs Elysees, December 15, 2018. Christoph Hardt/Press Association. All rights reserved. This public opinion is measured by the polls and by the words exchanged on the square; these reflect its meaning and development, and it is what everything will ultimately depend on. There is clearly a powerful emotional dimension. The hatred that the President inspires among a large number of citizens (not just in François Ruffin’s proclamations), his way of exercising power and the style of ‘governance’ he embodies, has rightly been mentioned. There is nothing irrational in this, whatever is said about it, rather the materialization here and now, in twenty-first century France, of a political truth known since Machiavelli (an author whom Emmanuel Macron seems to have studied): the fear inspired by rulers is manageable, it can even be useful, but hatred is harder to manage, unless the ‘prince’ undertakes a conversion, an ostentatious change of personality (as we have sometimes seen in exceptional situations, most often linked to the requirements of ‘public safety’). I very much doubt that this conversion is possible, not only for psychological reasons, but because it would require that our President – as exhorted by some of his helpless supporters – somehow exchange one political family for another, ‘betraying’ those who ‘made’ him what he is and brought him to the vestibule of power, in favour of those he had fooled in his electoral campaign (conducted, it must be admitted, with effectiveness and talent). He is surely not Machiavellian enough for that. But above all, the emotional dimension is part of an objective situation that leaves no escape. In another famous formula, Lenin described it as a characteristic of ‘revolutionary situations’ (though we should not jump the gun) that a crisis is irreversible when those at the top can no longer govern as before, and those at the bottom no longer want to be governed as before. A crisis is irreversible when those at the top can no longer govern as before, and those at the bottom no longer want to be governed as before. This is indeed the case today, and is what was played out behind the scenes of Macron’s 10 December speech, between consultations and canny advice (including, as we have just learned, that of former President Sarkozy) about the sensitive issue of the threshold, both ﬁnancial and symbolic, to be crossed or not in seeking to resolve the conﬂict, or at least trying to postpone its dénouement. Everything has visibly crystallized around a single measure that focused the antagonism and will continue to do so. Either the wealth tax will be re-established, under that name or an equivalent, and even extended to cover both the increased budgetary costs of a somewhat more equitable social policy and the needs of a real energy transition, or else we are witnessing the confirmation of its abolition, sealing the alliance of Bercy and the CAC 40(and Wall Street), even of Neuilly, which means that sooner or later what has just been given by one hand will be taken back by the other. The answer is now certain: the President will not give in, otherwise he would lose his prestige, his government and his advisers, not to mention what remains of his parliamentary majority. He will therefore sink ever deeper into a blind alley, with the risk of having to declare a real state of emergency (for the time being described as ‘social and economic’, but already correlated with a ‘rigorous’ discourse of public order). It is not from him that we should expect a solution, except for the worst. The situation can therefore only evolve, unblock, or move forward, as we would like, on the side of the ‘movement’ itself. It depends closely on what this is and what it will become. Like everyone else (except those with an innate revolutionary science), I am from this point of view both passionate and expectant, ready to participate in initiatives of solidarity and the defence of democratic rights (above all the right to demonstrate freely and safely, without being subject to indiscriminate attack with military weapons), and to formulate opinions, necessarily revisable, which may help public debate. I will clearly not claim for myself an increase in living standard that I do not need. I perceive the absolute and decisive urgency for this, and I can see other equally fundamental interests appearing in counterpoint, and I try imaginatively to take the point of view of the whole movement, which increasingly involves the whole of society and will now play an essential part in its future. Indeed, those French people who do not have any interest in the gilets jaunes obtaining satisfaction, forcing a halt to neoliberal logic and thereby initiating a democratic and social transition, are a minority, and we all have a duty to understand and a right to express ourselves, or rather a right to hypothesize. This may change, but it is the massive, unavoidable fact of the moment. Who are the gilets jaunes, in the richness and multiplicity of their gatherings? Their statements, the descriptions they give of themselves, corroborated by some remarkable surveys carried out in real time (which does much to restore the civic function of the social sciences), show that they constitute a representative sample (and for this reason widely supported), not of the French population in the static sense of the term (that recorded in censuses by occupational category, age, gender, place of residence, etc. ), but of what it is becoming, owing to the massive trends of contemporary capitalism, which the policies mentioned above have had the effect of aggravating and making more perceptible. Without unnecessarily complicating matters, I would say that they embody and denounce the generalized precariousness of activity and livelihoods that today affects millions of French people and immigrants of every educational level and geographical location (with the obvious exception of the beaux quartiers and certain ‘bobo’ habitats), because they are caught between two major trends characteristic of neo-liberalism, both based on the application of ‘free and undistorted competition’. On the one hand, the new iron law of wage compression, both direct and indirect (including pensions, of course), to which globalization and deregulated technological change contribute, as well as the weakening of trade-union organizations; on the other hand, the accelerated uberization of ‘manual’ or ‘intellectual’ jobs that do not depend on companies with a fixed location but rather on digital platforms, creating a competition ‘to the death’ between individuals (called ‘self-entrepreneurs’) whom their masters control by intermittent demand and by debt. The two tendencies converge, and workers or employees from cities, suburbs and countryside who have not yet reached the bottom see that they cannot stop it, even if ofﬁcial language proclaims that we are entering the individualistic skilled paradise of a ‘start-up nation’. But this socio-economic representation is also coupled with a political representation that makes the gilets jaunes movement so original and has inevitably generated a flood of interpretations, even exploitations. Observing the bankruptcy of representative politics or its disqualiﬁcation, to which several long-term institutional and sociological factors have contributed, not to mention the methods of government of the current administration that I mentioned above, the gilets jaunes have in brief proposed a contemporary alternative to the decline of politics, based on the self-representation (and therefore the presence in person) of ‘indignant’ citizens in the public square, with the support of their localities and the technical assistance of ‘network’ communication. 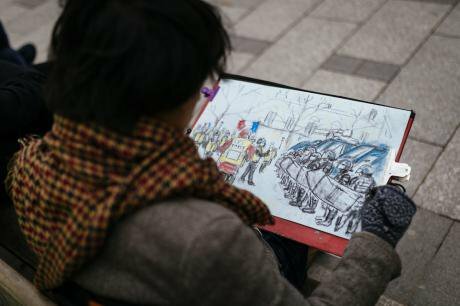 The gilets jaunes have proposed a contemporary alternative to the decline of politics, based on the self-representation (and therefore the presence in person) of ‘indignant’ citizens in the public square. This alternative is remarkable in that it invents a new form of articulation between local solidarity, gatherings, and national convergence, even if it also generates tensions (viz. the episode of ‘threats’ against the delegation that proposed to meet the prime minister). Between these two modes of representation: that of current trends that are socially developing, and the political representation of direct action and uncoded speech (which particularly implies keeping electoral apparatuses, or even just organized activists, at bay, even when they could serve as supporters or spokespersons), there is obviously a resonance, a parallelism, but this should not be hastily transformed into a new ‘essence’ of collective subjectivity, whether in the name of ‘multitude’ or ‘plebs’. I believe that it should be seen as the symptom and potential agent of an exceptional, rapidly evolving and perhaps creative conjuncture, provided that certain conditions are met. Several conditions, actually. Because the movement is both powerful, by the support it generates, by its despair, by its novelty, by the strategic dimension of the double ‘problem’ that caused and triggered it: tax injustice, the economic and ecological contradiction; and at the same time fragile, like any revolt that depends on the endurance of the individuals who bear it, without the backing of any organization, and against whom the privileged classes, a good part of the media, and especially the machinery of the state, will gradually unite. Under what conditions can it last, which means, win, since its very existence has become the issue at stake? In a non-exhaustive way, I would suggest three: convergence with other movements, less original but not less representative; civility, or the ability to resist the spiral of mimetic violence in relation to the state; finally, and above all, the emergence of a political idea, which extends the conjunctural invention by anchoring it in institutions, and thus confers on it the capacity of a ‘counter-power’. The issue of convergence is clearly crucial, in terms of both duration and effectiveness. It must be distinguished not only from the simple phenomenon of public opinion (what the pollsters call sympathy, even solidarity), though it can inflect the orientation of this, but also from a historical fusion of resistance movements and aspirations to another society, whether in the form of an emerging organization or, on the contrary, of a ‘coming insurrection’, anarchically crystallized around a generic power of refusal or dismissal. But on the other hand, we should recognize that its possibility holds the keys to a profound change in the balance of power and power relations within our society. Without this, however strong the motivation of the gilets jaunes movement may be and however resilient the causes that generated it, it risks finding itself caught between two probable effects of isolation: discouragement and radicalization, which would mean a collapse of its political capacity. The gilets jaunes movement… risks finding itself caught between two probable effects of isolation: discouragement and radicalization, which would mean a collapse of its political capacity. But considering the possibility of a convergence, even if still virtual, requires caution in formulations at the same time as openness towards the novel event and the surprises it might bring. On the one hand, I would say that there must be compatibility between heterogeneous demands and expressions, which is not guaranteed, since there is nothing like a spontaneous ‘commonality’ of social demands (in the face of the ‘sole adversary’ of the neo-liberal monster), and above all, there are potentially all kinds of very real conjunctural contradictions between the various logics of change (of which a good example is the clash between projects to combat global warming and the urgency of cheap energy for mass consumption). And on the other hand, there should be an acknowledged and recognized diversity of the components of the ‘popular’ aspiration to social and political democratization, allowing discussions or even negotiations between these, but preserving at all costs the uniqueness of their origins and their own voices. This is why we can indeed speak, in Gramscian terminology, of the constitution of a ‘historic bloc’ and the ‘reversal of hegemony’. But we should not get into the conception of ‘chains of equivalence’ imagined by the champions of a ‘left-wing populism’ inspired by Ernesto Laclau, who would like to translate all demands into a single language, suitably idealized (and whose counterpart, as Chantal Mouffe has recently made very clear, is the emphasis placed on the power of emotions to the detriment of reasoning, and the need for a personalized leadership, which today shows how little it matches the movement’s aspirations). I will risk once again the expression I used a few years ago, when Greek citizens revolted against the diktat of the European troika: what is needed is rather a counter-populism, equally distant both from anti-popular oligarchical politics and from the ideological populisms of left or right. Quite a conundrum! What we see in the current situation seems to be, on the one hand, the tremendous driving force of a movement of demands and revolt that puts the idea of active citizenship back on the agenda, and on the other hand, the extreme unevenness of the effects it has on the expression of other demands for justice, equality and empowerment. What is needed is rather a counter-populism, equally distant both from anti-popular oligarchical politics and from the ideological populisms of left or right. In terms of positive effects, I would include right away the fact that the ‘climate marches’ of 8 December were not only not minimized or discouraged by the simultaneous demonstration of the gilets jaunes, but even proﬁted from this to make the idea more strongly heard that there could be no ecological transition without a huge effort in terms of social justice and cost sharing. Hence the encounters that actually took place here and there between different groups of marchers. Far more cautiously, I would also include here the possible convergences with opposition trade unionists and farmers’ organizations, since I do not take for granted that the historical crisis of these is synonymous with an inevitable disappearance, and the heat of a crisis situation may well be favourable to regenerating their militant capacities. There are signs that this is the case. On the other side, however, I would note that the Day to Combat Violence against Women (25 November) clearly suffered, in its attendance and visibility, from competition with the booming gilets jaunes movement. This does not mean that there is incompatibility, but that we are in very heterogeneous registers, discursively and emotionally, ideologically and socially – if not necessarily permanently so, especially since all observers emphasize as a real sign of changing times the active presence of women in the gilets jaunes movement, but along other lines of mobilization and division. The Day to Combat Violence against Women (25 November) clearly suffered, in its attendance and visibility, from competition with the booming gilets jaunes movement. And I will reserve as the great unknown, perhaps decisive, the question of whether and how convergence can take place between the gilets jaunes movement and the potential revolt of young people in the banlieues whose existence is dominated by mass unemployment, urban and educational segregation, the abandonment of public services and the ravages of state racism. The ‘political anti-racism’ movement that denounces this institutional racism (particularly discrimination in housing and employment, and police violence against ‘non-white’ youth) has divided tactically in its relationship to the gilets jaunes: one section (the Rosa Parks collective) seeking to maintain its independence so as to assert the irreducibility of racial oppression, the other (the Adama committee) preferring to call right away for a merger or interpenetration. Naturally I do not know how things will end up. The government may decide to aggravate matters by increasing brutality and humiliation towards young people in the banlieue (as we saw, ignobly, at Mantes-la-Jolie), in order to shift the main focus of conﬂict in this direction and give it more violent forms, at the risk of being uncontrollable. A desirable (should we say utopian?) evolution would consist in initiating a conversation, perhaps at a distance, perhaps intermittently, between those citizens who articulate social violence, and those who articulate racial violence; it is clear that the two overlap very widely, but their voices and emotions are not the same. This also means that the ‘identity’ issues that the President is now trying to play on cannot be indefinitely neutralized, and everyone knows the damage they can lead to. They must be formulated as such. Perhaps the school and university students who have begun to strike over demands ranging from the rejection of mechanisms of exclusion and segregation by school catchment area through to asserting equal rights for students of all nationalities and colours, will play in this case, as at other times, a role of mediators and catalysts. Convergence is a problem, which means both a horizon of possibilities and a knot of contradictions, each of which can be used to disintegrate support for the movement. Convergence is a problem, which means both a horizon of possibilities and a knot of contradictions, each of which can be used to disintegrate support for the movement. And so we have to address the question of violence. As I write, the terrorist attack in Strasbourg has just occurred, creating an easily understandable emotion and tension. And as in other circumstances, the government (followed by part of the press) seems unable to resist the temptation to instrumentalize this, combining a call for national unity, as if it wanted to conceal everything, with a security deployment that can serve several purposes. The main, permanent, omnipresent violence, to which we must hope our fellow citizens will not get accustomed, is police and judicial violence. This has a long history: think of the brutal treatment of students protesting the El Khomri law under the previous presidency, the ‘legalized’ murder of young Rémi Fraisse, the forcible dismantling of the ZAD at Notre-Dame des Landes, the multiple actions of the police against individual and collective freedoms, the unfair or disproportionate sentences. It relies on or encourages the quasi-fascist elements in the police (Benalla...). 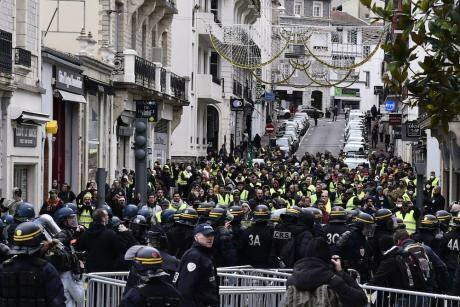 At this very moment, it is trying to create an atmosphere of fear around the next planned demonstration of the gilets jaunes, and a kind of expectation of confrontation and destruction. This poses a fundamental problem, both strategic and tactical. Let me be blunt: I believe that the symmetry of state violence and ‘popular’ counter-violence is a death trap from which we must collectively find the means to escape at all costs. Not all keys to this are in the hands of the movement, but it must make a choice, just as each of its participants must choose. I believe that the symmetry of state violence and ‘popular’ counter-violence is a death trap from which we must collectively find the means to escape at all costs. I hear and even understand the argument that, without an outbreak of violence, the government would not have taken notice of the confrontation. But I would point out that the decisive factor was not the violence itself, but the fact that it did not lead to a decline in public support, as measured by the polls. This is a strictly conjunctural phenomenon, there is nothing permanent or established about it. Similarly, I hear and understand the concrete analysis that shows that attacks on police officers and the looting of shops are by no means just the work of organized ‘casseurs’ (black block or otherwise). They involve demonstrators and an accumulation of humiliations and blows that has turned into ‘just’ anger against the representatives and symbols of a society of injustice. It is they whom, by inclination and calculation, Macron stigmatized in his speech by seeking to dissociate them from right-minded people. Nevertheless, the theory that poses an equivalence, or a symmetry, between economic or ‘structural’ violence suffered and political or ‘insurrectional’ violence preached and premeditated, as if the latter were not only a revenge against the former, but a way of bringing it to an end, is as historically false as it is politically dangerous. Bertolt Brecht may have written, in a nice line often quoted: ‘What is robbing a bank compared with founding one?’but this is nonsense all the same, at least in the current situation. Banks can laugh about damage to one of their branches, and all citizens have a bank account or even an overdraft. Physical violence as counter-violence, anti-state or anti-capitalist, does not create any favourable balance of power, let alone a ‘revolutionary consciousness’. On the contrary, it makes the final decision depend on ﬂashballs, grenades, perhaps tanks. It has been able to create movements of sympathy in the past (I am not talking about colonial situations and wars of liberation): this needs only one dead person (as in 1986), or a mass bludgeoning (as in May 1968), provided it is not planned for this purpose. But in the current place and time I see three absolutely crippling disadvantages: it will very quickly constitute a factor of public disaffection exploitable by the authorities, especially if there are also economic difficulties attributable to the movement; it will tend to frame the conﬂict in terms of acceptance or rejection of the ‘state’, which is not at all what is at stake; finally it will encourage a convergence between extremists of right and left, under the pretext that ‘the enemy of my enemy cannot be my enemy’ (if I understand correctly this risky expression used by Éric Hazan). It seems to me that the deeply civic gilets jaunes movement must also retain the privilege of civility, or anti-violence, however hard this may sometimes seem to some of its participants or supporters, and however perverse the provocative strategies used to undermine it. It is not a question of giving in to the blackmail of chaos, of cultivating fear within the movement, but of demonstrating a strength and intelligence superior to government manoeuvres, which is essential today to open up major strategic opportunities. But this also requires the rapid emergence of credible prospects for collective action, debate and even confrontation between the various sensitivities and even ideologies at work in the movement, as well as for meeting other social demands and for building a power base within the institutions. 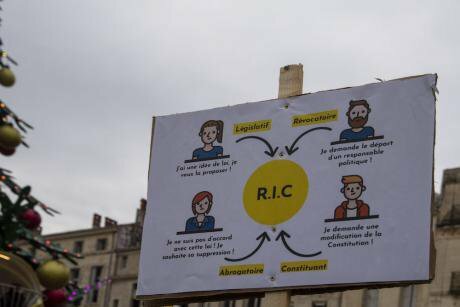 Call for the RIC (Référendum d’Initiative Citoyenne, or Citizens’ Initiative Referendum) at the Place de la Comedie, Montpellier, France, on December 15, 2018. Beracassat Eric/Press Association. All rights reserved.Such prospects, as many people have said and I agree, do not lie in the forthcoming elections (which will inevitably see the advance of the far right, especially in the ‘European’ elections); they are a function of the radical democratic impetus that is clearly central to the novelty of the gilets jaunes: what I called above their alternative to the decline of politics. But an impulse is not enough, it needs continuous development, and therefore it needs a political idea, this time in the sense of understanding situations, seizing opportunities, grasping levers. So let us look for this idea, or rather listen to whether, in some of the words that are circulating, on the Internet or otherwise, it has not already announced itself. But an impulse is not enough, it needs continuous development, and therefore it needs a political idea. One slogan hits the nail on the head in this respect: the call for an États Généraux, which evokes for everyone (the virtues of French national education!) the great historical moment of the constitution of the ‘political people’ in the face of the privileged strata, and which is clearly also called for by the insistent comparison, which Macron himself brought about, of the current presidential power with the monarchical tradition. We are not here in the famous ‘antique guise’ described by Marx in well-known texts, with mass movements serving as an imaginary screen on which to project a desire for revolution. Rather, we are in a confrontation that is emerging between the two extremes of the great cycle that the institutions of liberalism have undergone in our country in modern times, and which is signalled each time by the widening of demands and the very form of participation in public affairs. What I find particularly interesting in this idea is that it has been formulated in a special connection with the question of tax justice (and consequently the standard of living and social benefits), both at the ‘centre’ and on the ‘periphery’, by intellectuals and even politicians, and by the gilets jaunes of Brittany who came together to formulate this in Carhaix on 8 December, and are soon having to return there again. It is the fact that, in the tradition of the ‘registers of grievances’ that preceded the Revolution, it combines the idea of a collective drafting from below with the demand for a national outlet, a new governmentality of economic choices and taxation, which no longer restricts citizens to the alternative of submission or revolt. But other equally constructive initiatives use a different language, such as the gilets jaunes of Commercy in the Meuse, who talk about assemblies or people’s committees, and consequently focus not on an ‘ascent’ of demands or on governmentality, but on direct local democracy and the lived experiment of equality. Or the ‘Maison du peuple’ of Saint-Nazaire, located in a former job centre marked for demolition, where the movement’s initiatives are organized on a daily basis by self-management, reflecting a long and heroic history of workers’ struggles and autonomy. Are these contradictory? It is not for me to decide this prematurely and presumptuously, although I tend to see the two approaches as complementary rather than clashing. Time will tell, if the movement continues. But I believe that all these ways in which collective ‘speaking out’ (Michel de Certeau’s phrase in May 1968) and the desire to escape from a ‘subaltern’ position in society and public life are powerfully expressed, need institutional anchorage if they are to effectively build a counter-power in the face of a technocratic monopoly equipped with economic expertise, public power and legal legitimacy. This idea seems to me to be broadly similar to that put forward by Antonio Negri, except that I am talking not about ‘dual power’ but counter-power. It is not 1917, and most likely will never be again. Finding an institutional anchorage does not mean that we ‘return’ to the fold of existing institutions, under the yoke of administrative and representative frameworks, delegations and concessions. On the contrary, it can mean seizing an opportunity presented and turning this against its top-down and condescending instrumentalization. I therefore suggest that all this could be given concrete form, opening up a dialectic of self-representation and governmentality, if municipalities (starting with some of them that set an example: those most sensitive to the urgency of the situation or most open to democratic invention) now decided to open their doors to the local organization of the movement, and declared themselves ready to pass on its demands or proposals to the government. It can mean seizing an opportunity presented and turning this against its top-down and condescending instrumentalization. The legitimacy of the communes in France is absolutely unassailable as long as we are in the Republic, and the strategic function they perform in communication between the government and the citizens (and therefore between the citizens and the government), given that Parliament is no more than a registration chamber and a place of jousting between government and opposition, has just been explicitly acknowledged by the President. Indeed, the communes are potentially at the heart of the confrontation under way, since the only democratic concession he mentioned was to announce that he would go ‘region by region’ to the mayors of France who ‘represent the Republic on the ground’, to gather, through them, the ‘requests’ of the citizens. But the mayors are, precisely, the people that citizens want, or what they ask them to be. And there is no reason, in the midst of a social crisis in which the responsibility of a political leader appears overwhelming, to wait for him to dictate the modalities, timing and limits of the consultation needed to relegitimize himself. What we need, on the contrary, is for the ‘natural’ site of active citizenship, where, from the outset and in principle, constituent power (the people) and constituted powers (the basic elected representatives) are able to exchange places and means, to take their autonomy and assert their prerogatives. In this way, the confrontation that the President sought at all costs to avoid last Monday would be forced into being. That is how democracy is invented and perhaps, at the end of the day, how a regime can change. It is not a long road from the roundabout to the town hall, via the public square, which does not mean it is easy to travel. Demonstrations, popular assemblies, municipal counter-power, États Généraux or their modern equivalent, such is perhaps the squaring of the circle; it must be resolved on a daily basis and over the coming weeks, probably quite quickly, so that a political idea that everyone now needs can emerge from a revolt that no one had expected. A race is under way, and we must find ways to win it. This is the hypothesis that I modestly want to put forward for discussion. Published in the original French by Mediapart on December 13. Thanks go to David Fernbach for the English translation prepared for Verso. The term coined by Danish prime minister Poul Nyrup Rasmussen in the 1990s to refer to a combination of labour-market flexibility in a dynamic economic and security for workers – the latter often more conspicuous by its absence. Emmanuel Macron claimed in his election campaign to be ‘master of the clocks’, in apparent reference to the 1991 book by Philippe Delmas, Le Maître des horloges, modernité de l’action publique, though the metaphor goes back to the Voltaire’s ‘great clockmaker’. The Toulouse School of Economics (TSE), presided by Nobel-prize economist Jean Tirole. The journalist and filmmaker François Ruffin was a moving spirit of the Nuit Debout protests in spring 2016; he was elected to the National Assembly in June 2017, and is a prominent supporter of the gilets jaunes. Bercy is the seat of the ministry of finance, the CAC 40 the benchmark index of French share prices. The commune just west of Paris, with the headquarters of several large corporations as well as wealthy residential quarters. A reference to the manifesto of the Invisible Committee, The Coming Insurrection, Semiotex(e), 2007. On 6 December, 150 students were arrested and forced to kneel with their hands behind their heads for hours by police following a demonstration at a secondary school in the Paris suburb of Mantes-la-Jolie. The botanist Rémi Fraisse was killed by a flashbang grenade on 26 October 2014, while protesting the construction of the Sivens Dam in the department of Tarn. ‘Zone d’aménagement differé’, i.e. ‘deferred development site’. The pioneering Zadistes were militants who occupied the projected airport site at Notre-Dame-des-Landes. The security officer Alexandre Benalla was deputy chief of staff to President Macron. On 18 July 2018, he was identified beating up a young protester. Macron, who seems to have been personally close to Benalla, defended his chief of staff, who escaped with a two-week suspension. An investigation by the Senate is still under way.